Atushi Asokawa goes through the wreckage of Togura Elementary School, smashed by Friday's tsunami. A school clock is frozen the moment the earthquake hit. Principal spends days cleaning school: "I will wait for the kids to come back"
Minamisanriku, Japan (CNN) -- Atsushi Asokawa gravely goes through a pile of mud at Togura Elementary School, one of the few buildings still standing in this Miyagi prefecture town that was flattened when a wall of water surged from the nearby coast after Friday's quake. The school is only 100 meters from shore. 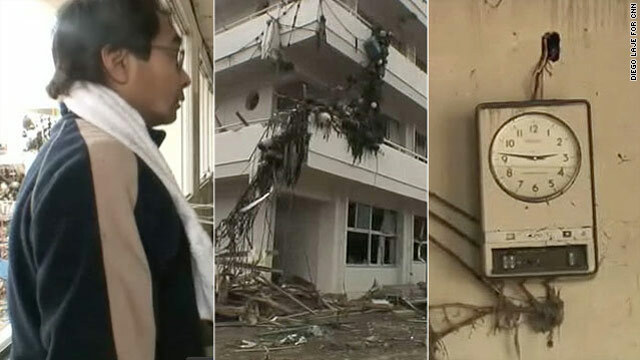 A CNN crew accompanied Asokawa, principal of the school, on Tuesday as he climbed the steps and inspected the total damage to the school for the first time. There is mud, seaweed and fishing nets in the top floor of the 3-story building. On one of the walls of the school the clock is frozen at 2:46 -- the time when the 9.0-magnitude earthquake struck. Toys, bags, wood, sand and seaweed are tangled in confusion. A stool hangs from the ceiling. Backpacks were orderly placed on cupboards, where 107 students ages 6 to 12 left them on Friday, when they ran for their lives. But Asokawa is worried: the school has 108 students. One child was absent that day and he is missing. The rest of his students are in a nearby shelter, taken care of by their teachers, he said. They are the lucky ones: half the population of Minamisanriku -- some 9,500 people -- are missing after the tsunami smashed into the town. "First came the earthquake, then kids went under their desks," recalled Asokawa. "Later children went to the school courtyard and ran up the hill [behind the school]." He had followed Japanese standard procedure, a well-rehearsed tsunami evacuation routine everyone is familiar with in this coastal town. 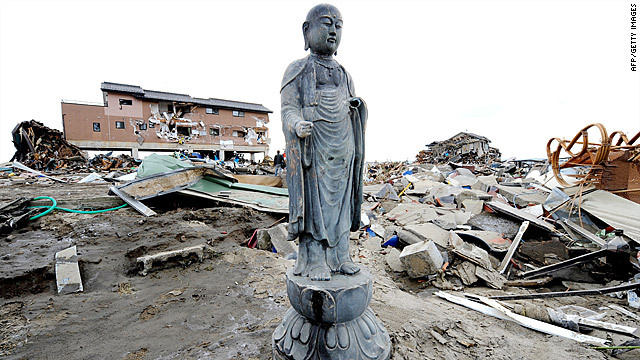 But no rule book took Japan's most severe earthquake and tidal wave in memory into account. "We saw a high wave coming in, we saw it was still dangerous, it was so high, and we ran to a much higher place," Asokawa said. Togura Elementary School stands in the middle of what once was a town and now barely has any marks of human existence. The force of the water erased concrete roads and placed a full-grown tree in the school corridor, it's roots blocking the way. Asokawa's career in education in Japan spanned almost three decades. Two years ago he was promoted to principal and posted to Minamisanriku. About a week before the disaster a new gym had been completed. It is now a shapeless structure covered in seaweed. Shortly before talking to CNN, Asokawa was relieved to finally learn his family had been spared by the elements. Nevertheless, he busies himself, preparing for the day he hopes the school -- in some form -- may reopen. He sifts through the muck and goes through school office desks. "I'm looking for important files, to ask for instructions from the government," he said. "I will wait for the kids to come back," he told CNN, as he continued going through his files.